Sony Pictures has released the first official poster for Quentin Tarantino’s forthcoming epic drama Once Upon a Time in Hollywood. The film stars Margot Robbie as Sharon Tate, Leonardo DiCaprio as her actor friend Rick Dalton and Brad Pitt as Dalton’s longtime stunt double Cliff Booth. 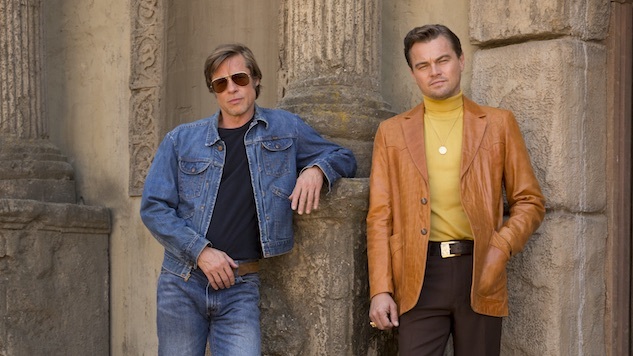 The poster shows DiCaprio and Pitt dressed in late-1960s attire with the Hollywood sign in the background. The film focuses on the 1969 murder of Sharon Tate and the changes that happened in Hollywood around that time to make it unfamiliar to acting veterans like Dalton and Booth. It will be Tarantino’s ninth feature as sole writer and director, and it is something of a passion project for him, having lived in Los Angeles his whole life and observed how the city has changed since he grew up. Additional cast members include Al Pacino, Dakota Fanning, Damian Lewis, Kurt Russell, Timothy Olyphant and the late Luke Perry, whose posthumous turn as real-life Western actor Wayne Maunder will be his final role. Once Upon a Time in Hollywood comes out in theaters July 26. Check out the poster below, as well as the first set of stills from the film.